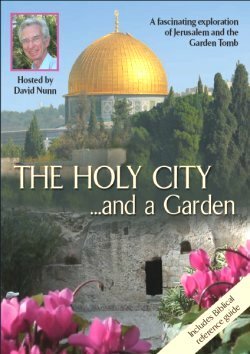 A compelling combination, contrasting Jewish and Christian beliefs about Jesus! Here's a glittering kaleidoscope of Jerusalem, its Jewish ceremonies and its turbulent past. The noise and bustle is in dramatic contrast to the peace and serenity of its Garden Tomb! Was it really here that the body of Jesus was laid - and from here that he rose triumphant over death? Another fascinating exploration with David Nunn. (Duration: 23 mins) INCLUDES BIBLICAL REFERENCE BOOKLET. "VERY SPECIAL GEM OF A FILM"
Rt Rev MICHAEL BAUGHEN - former Bishop of Chester.